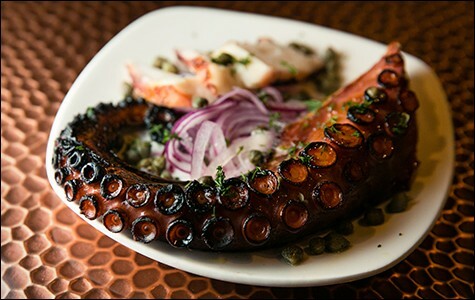 The East Bay's most refined Greek restaurant celebrates good ingredients cooked simply. The grilled octopus was served in all of its cephalopodian glory. It's no secret that the Bay Area has an embarrassment of riches when it comes to international cuisines. But Greek food has never been one of the East Bay's strengths. If I want a gyro and fries, I'll hit up Simply Greek on Piedmont Avenue. If I want a spread of dips and fresh pita, I'll head to Ikaros in the Grand Lake neighborhood. But for a more elegant, fine-dining type of Greek experience? Until now there hasn't been a good option. Nick Eftimiou, chef-owner of Pathos, a new upscale Greek restaurant in downtown Berkeley, said he wanted to correct that shortcoming — to offer the kind of simple, yet refined, food he fell in love with during family trips to Greece when he was growing up. At Pathos, the decor is just shy of white-tablecloth. One wall of the restaurant is lined with faux-ancient ceramic vases in little display cubbies; the other is occupied by a modern-looking bar, complete with the requisite flat-screen TV. That particular blend of aesthetics — of the classical and the contemporary — translates to the menu as well, where rustic, traditional recipes (passed down from Eftimiou's grandmother) are presented with new shine. The menu is designed to be conducive to family-style dining, and, aside from the entrées, there's a fixed price for each category of dishes: $7 for soups, $8 for salads, and $9 for orektikos — the small plates that make up almost half of the menu. Many of the best dishes used simple cooking techniques to highlight fresh, high-quality seafood. The htapodi, or grilled octopus, featured just one thick tentacle, presented whole, in all of its cephalopodian glory, adorned only with capers that fit perfectly (and adorably) into the suction cups. 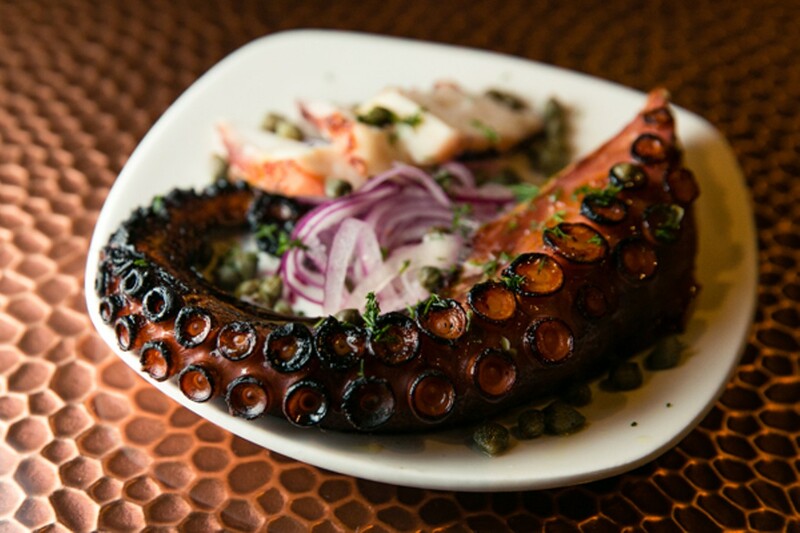 Eftimiou cooks the octopus, which he gets from off the coast of Spain, in the traditional Greek manner, using a three-day process that involves tenderizing, brining, dry-roasting, and grilling. The result is meat that's tender and satisfying, and an exterior that's smoky and slightly crisp. Another highlight was a plate of fried smelts — crunchy, piping-hot little fishies that we popped in our mouths whole, as though they were French fries. As with the octopus, these were served almost entirely unadorned, with only a cheesecloth-wrapped half-lemon — an elegant touch — on the side for squeezing. Probably the most unorthodox of the appetizers I tried was Eftimiou's take on dolmades, or stuffed grape leaves. Most of the versions I've eaten were cold and mushy. Here, the grape leaves were lemony without being excessively sour, and the rice-and-ground-lamb filling was densely packed and meaty. Most appealingly, the dolmades were served warm. Of the entrées, my favorite was the moussaka, which best illustrated the restaurant's modern, refined sensibility. Any moussaka lover will find the components in Pathos' version familiar: a layer of roasted eggplant topped with seasoned ground lamb and hearty bechamel. Eftimiou's tweaks are subtle: He uses Greek yogurt in the bechamel instead of cheese, creating a lighter, smoother texture. And instead of incorporating sliced potatoes in the moussaka itself, he serves roasted Yukon Gold potatoes on the side, adding an element of crunch. The dish is finished with another generous dollop of yogurt on top — a touch that's traditional to the island of Crete, Eftimiou said. Any time a restaurant offers a whole fish option, chances are I'll order it, and the wood-oven-roasted lavraki (Mediterranean seabass) — a big, beautifully cooked fish — was another highlight. Again, the fish was prepared simply: stuffed with fresh herbs, wrapped in paper and steamed in the oven, then roasted. You can have the kitchen bone the fish for you, or have it served whole. We requested the latter option, though the head somehow got lost en route to the table, meaning we missed out on the dish's greatest reward. Still, I loved how the fish's delicate, moist flesh was allowed to shine, and how the simple lemon-saffron butter sauce soaked deliciously into the rice pilaf underneath. But not every dish awakened our emotions in the rousing, Aristotelian sense that the restaurant's name is meant to evoke. The horiatiki, which most of us think of as a classic Greek salad, featured crisp cucumbers and high-quality olives and feta cheese. It being January, though, a mix of multi-colored heirloom tomatoes looked better than they tasted. The triada was a spread of three dips, served with wedges of house-baked pita, similar to rosemary flatbread, which were tasty enough. But aside from the refreshingly tangy cucumber-and-yogurt tzatziki (one of the better versions I've tasted), the dips disappointed: The spicy tirokafteri cheese spread was one-dimensional in its spiciness; the eggplant-based melitzanosalata was served ice cold and had little discernible flavor besides being garlicky. And although the gently spiced keftedes — a version of the lamb meatballs served at almost every Greek restaurant — were drenched in an enjoyably savory tomato sauce, I found the meatballs themselves to be overly chewy and dry. At $9 for three tiny meatballs, these were also one of the poorer values on the menu. For dessert, the only current option is baklava (made by Eftimiou's mother) — a big, flaky slice, stuffed with a crumbly walnut-and-almond filling and drizzled with Greek honey. You'd be wise to wash it down with a cup of coffee or tea. A note on sourcing: Although "Pathos Organic Kitchen" is splashed on the menu and the big banner out front, the restaurant is still in the process of getting its organic certification. Savvy Pollanites will point out that the Niman Ranch meats that pervade the menu are not organic, and some of the imported Greek ingredients aren't either. Still, Eftimiou said, all of the produce is organic, and the meat and seafood come from sustainable sources. Is that focus, along with the restaurant's upscale ambience, worth paying an extra four or five dollars for a given dish? I suppose that depends in part on your food politics, but as long as the restaurant has the chops to pull off that grilled octopus and oven-roasted fish — dishes where the main ingredient is served practically naked, with no way to hide any of the product's flaws? I have a hard time complaining.